What about as a counter to Khopesh, by putting it on the character equipped with Khopesh, so they can't shoot anyone? Short of support removal, they aren't doing anything other than being a body in stories. FYI - A player can never choose a character with Invulnerability to be wounded much in the same way a character with terror icons can never be chosen to go insane and for this reason an opponent's character with Khopesh of the Abyss and Mask of Sthenelus attached effectively renders the Khopesh useless. However most players will place a Khopesh on a perfectly expendable character and will opt to apply the fatal wound to this character during the same turn the Khopesh was played to maximize damage to the opponent leaving no target for the mask on a later turn. 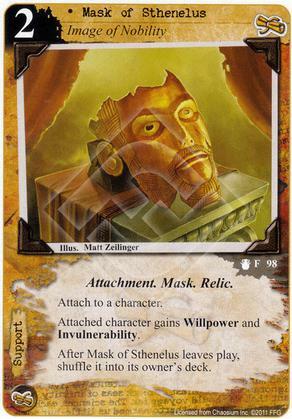 Willpower and Invulnerability are nice but the aspect of this card which pushes it into the 'playable' realm is it's 'Relic' effect returning it to your deck.